This is a Bluetooth headset conversion kit. It is made by J&M and is designed to allow you to convert your standard headset to a bluetooth headset. This includes all of the components necessary to convert an existing J&M brand CLAMP-ON style CORDED helmet headset, to a J&M BLUETOOTH helmet headset. 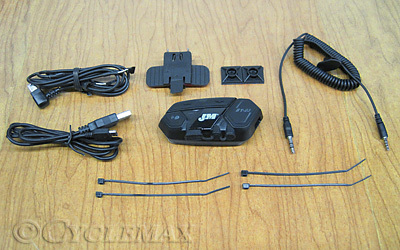 This kit will utilize your existing J&M component helmet speakers and microphone (with corresponding in-line plugs), to make installation a snap. Kit includes all necessary mounting hardware, plug-n-play wiring harness adapter, USB charge cable, aux input cable and complete installation/operation instructions. • Our elite series features both the boom and chin-bar mount style AeroMike VI microphones for the very best in wind and ambient noise cancelling at highway speeds. • Multifunctional Bluetooth software package includes standard profiles of HSP, HFP, A2DP Stereo & AVRCP, along with the J&M Exclusive helmet to helmet intercom profile.